DapperLads - *Exclusive* Eton Blue Jacket With Lt Gray Knickerbockers - Knickerbockers - US made Victorian fashion boys knickerbockers sets with genteel nostalgic appeal. 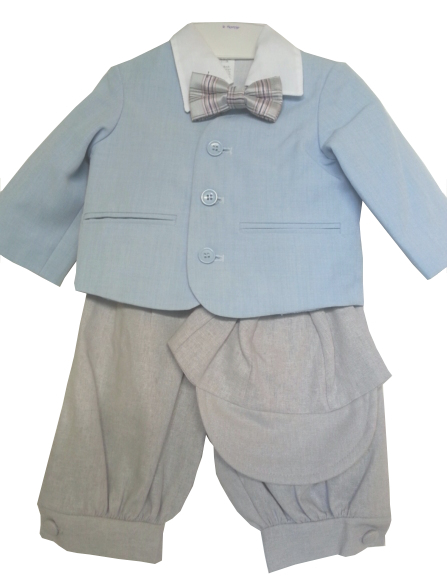 A DapperLads Design Original - The Victorian era English school eton jacket in a grayish blue is paired with lt gray knickerbockers and a lt gray patterned bow tie with blue and pink accents. The suit includes the lt gray cap and a white long sleeve shirt. Suspenders are sold separately if desired. The fully lined jacket and knicker pants are a linen look quality polyester which makes for less wrinkles. The shirt is 65% cotton, 35% polyester. Machine washable per instructions. US made exclusive of the jacket which is import. Runs true to size. The pie cut hat does run small and has a bit of elastic in back. Refer to the height / weight chart and order up if near the top of a size and choose carefully.